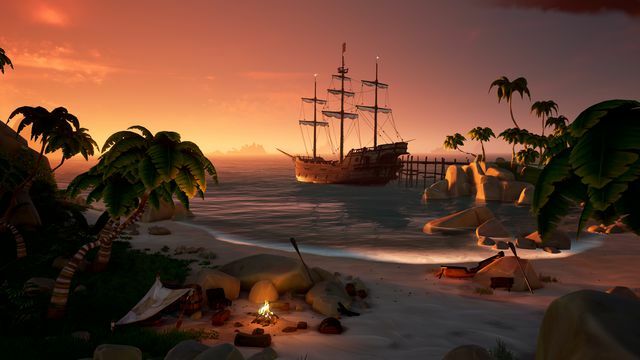 Sea of Thieves is turning one year old on March 20, and players have only seen four free expansion packs (along with weekly updates) since the game’s launch. Now that the game’s first anniversary is approaching, Rare has announced a new update. There’s still information to come regarding the specifics of these new features, but based on a new trailer, we can expect the following to be on its way to Sea of Thieves. Tall Tales looks like a new way to play Sea of Thieves. While we only saw a few moments from Shores of Gold, the first Tall Tale, we got to see what looked like a linear quest through a temple laden with traps and a voyage along the course of constellations. Quest content has been limited to short limited-time campaigns so far, so adding a broader campaign is a big addition to the game — and one that fans have sorely wanted. Rare will bundle The Arena, a previously announced PVP expansion, into the anniversary update. The Arena, a separate queue from the existing game, will pit crews of friends against opponents in a race to gather as much treasure as possible. What’s especially exciting is that the anniversary trailer showed off what might be a new ship, as well as new ways to damage ships. For instance, one crew took down an opponent’s central mast, which is an inventive way to stop an opponent without sinking them. Some smaller systems were showcased in the anniversary trailer, including fishing and cooking. We also see one pirate studying a book in the background. It all suggests that some kind of crafting is on the way. We don’t know how, exactly, these systems will work or what benefits they’ll bring, but they will provide new things to do on voyages and potentially new rewards. We also saw a ship-mounted harpoon that was used in battle against a megalodon, which is very exciting, because I want very badly to harpoon my foes in combat. The anniversary update, another free addition to the current Sea of Thieves game, will be made available on April 30.